Shell: Breathe weave stretch woven fabric and 3 layer thermal ply waterproof, windproof, breathable fabric trim, with synthetic leather palm and thumb, and goatskin fingers, wrap caps, and index finger and thumb reinforcement. Insulation: Naturaloft insulation package: 600 fill power of 70% goose down 30% waterfowl feathers on back of hand, Megaloft on palm side, Hydrowick microdenier lining with thermo-plush in the cuff, and Gore-Tex insert. Waterproof, Windproof, and Breathable. Guaranteed. 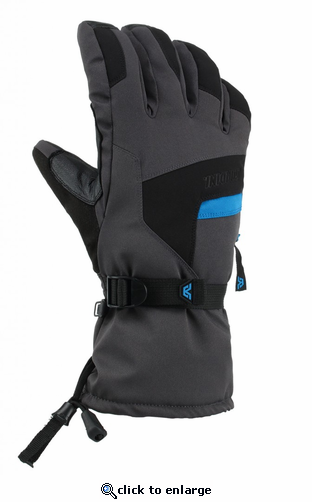 Features: Naturaloft, Megaloft, Gore-Tex, gauntlet cinch closure, pre-curved construction, wrap caps, nose wipe, index finger and thumb reinforcement, zippered heaterpack pocket, palm and thumb reinforcement.